Mama’s busy working on her stupid laptop, so she asked me to pitch-hit again. First off, Life is supposed to revolve around me, so you should know I had a great Christmas. I got some new toys and treats, The Kid (Domer) was home to play Chase with me, and every so often I dragged Mama off for walkies and lovins. I take my doggie duties extra-serious, you see. And a mama’s got to have regular exercise. The lovins? Well, that’s just icing on the cake! Before The Kid arrived, Mama took me for a ride in the car, which I love, but she didn’t tell me was where we were going. It was to the groomer’s, so I could get beautified. Well, I’m not exactly happy about it, but I like my furs all sweet-smelling. Then Mama and The Kid bustled around like bees wrapping presents, decorating the tree, and such. Wasn’t I being good?? The trick, as Mama learned from her friend Katybeth, is TREATS. And since I’m stomach-driven (Mama says that like it’s a bad thing! ), I’ll do most anything for something yummy. I won’t tell you what The Kid calls me when he’s complaining about my eating. I don’t think it’s very nice, and you shouldn’t have to hear words like that. Anyway, too soon, the festivities were over. The tree was bare without packages, and Mama said she was going to take down ALL the decorations after the new year rolled around. The Kid says I look sleepy here. I’m not. Definitely NOT! I’m always watching. 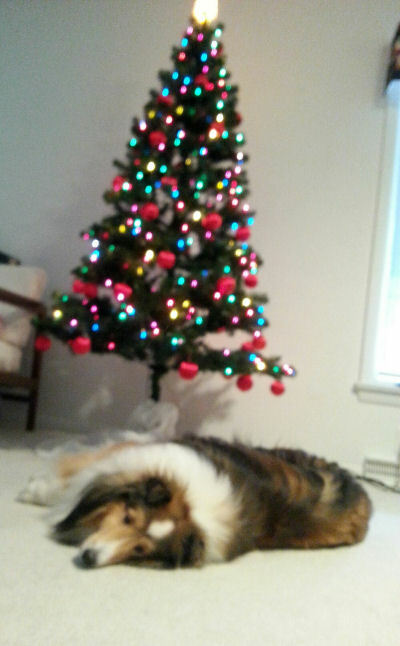 That’s what a Sheltie does. I sleep with one eye on my Mama at all times. Well, maybe not all night, when I know she’s going to be in bed for a while. This last picture, I’m actually bored. And I’m wondering, Gee, is that all the presents I’m going to get?! 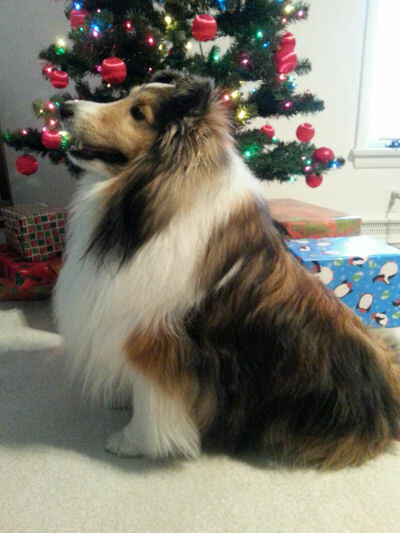 This entry was posted in Dogs and tagged car ride, Christmas, dog's view of Christmas, grooming, presents, treats. Bookmark the permalink. That first photo of Dallas is gorgeous. I’d say the trip to the groomer went very well! Thanks, Linda. She does a really GOOD job with him, probably because she’s had special training in how to do Shelties. I can make do in between times, but he’s just too much dog for me to hoist into the bathtub every time he needs to be there. Dallas, you are too adorable for words, and your coat looks gorgeous after grooming. Sleek and stately, if you ask me. Glad you had a nice Christmas with mom and the kid. It might be over, but guess what? There’s always next year, which is approximately 11 months away! Small comfort, Monica — you know very well that dogs can’t tell time, ha! And this particular dog seems to live merely from one meal to the next. Do yours do that, too, or can I blame cold weather on this insane begging?? That sounds like Henry. He’s always looking for the next meal, which is rather tiresome. On the other hand, when it comes to most foods, Oliver can take it or leave it, with the emphasis on the latter. Well, I think it’s normal for them to want food. It’s up to us to limit their intake. Every time I walk into the kitchen Henry follows. Generally I ignore his requests which come in the form of his soulful eyes and occasional barks. It’s for his own good. He eats twice a day with two light snacks and that’s it. When I first brought him home, I’d indulge him. But since then, he’s lost three pounds and has stayed at that weight. His vet says he looks good, and is at a good weight. He still follows me into the kitchen, hoping for more. No dice. You are sooo right to limit his intake. I measure Dallas’s food out every time I feed him — it’s the treats and “snackies” that are his downfall, I’m afraid. And sadly, the vet isn’t too sympathetic; merely says I must be the disciplinarian. Grrrr! Mr. Dallas, you are a great dog, I’d say. Nice to look at, and a great protector. That chase game sure does sound fun. Not to split hairs, Professor, but he’s a good “watcher,” not necessarily a good “protector.” There’s a difference, you know. Especially if FOOD is involved! Aha! You do have a point. Well…I wouldn’t think it of him! That’s because he hides it so well underneath all those furs. Pick him up, and you’ll notice! *laughs* I guess I’m just so used to my German things. No, I’m pretty sure he never even thought of climbing the tree, Janna. However, he regularly backed his furry bottom into it — once, he even managed to yank one of the ornaments off. It got stuck in his furs, and we got a big kick out of watching him try to detach it!! HAHAHHAHA! Dallas, you are BEYOND adorable and should start your own blog because I think you would be smashing success! And I know exactly how you feel because people are always saying the same thing about my eating. I eat A LOT, so I completely understand. You look absolutely handsome after your day at the grooming. But then again, I think your look handsome with or without the groomer. You are one CUTE dog! Love the pictures of you! Thanks for posting, Dallas. And please tell Mama I said hello, okay? Ron, you’re indulging him — shame, shame, ha! If I let him, he’d eat ALL DAY! I just don’t know where he puts it. Perhaps you and he simply have a fast metabolism or something. Thanks for stopping by and complimenting my Sheltie — still can’t believe he got hold of my blog while I was otherwise occupied! Happy first-full-week-in-2015 to you, my dear!! A dog does what a dog does! LOL! I know NOTHING about dogs! So if he wants to eat…I guess I would feed him until he can’t eat anymore. What do I know about…..dogs? My Italian mom is the same way, Tanya — she always thinks FOOD can solve whatever’s wrong with everybody and everything. No wonder the poor dog is packing a few pounds, ha! He gets an exorbitant amount of hugs, Audrey, especially when The Kid is home. Thank you for complimenting his beauty (he’s getting used to hearing people tell him what a pretty “Lassie dog” he is! Dallas prefers having the air conditioner blowing his furs about, Bella. Isn’t it funny how these fur-kids of ours think they rule the roost?! !